We use the latest internationally renowned scientific research to develop our products with optimum and effective levels of vitamins, minerals and active ingredients in-line with recognised safe upper levels for dietary supplements. Our products conform to international and natioanl standards. Including Good Manufacturing Practice (GMP). These industry best practices help ensure the safety, quality and efficacy of products. All of our products are halal certified by the relevant national and international bodies such as HMC in the UK. Our expert and highly experienced healthcare and pharmacology teams develop the tailored products and formulations to meet the varied needs of our customers. 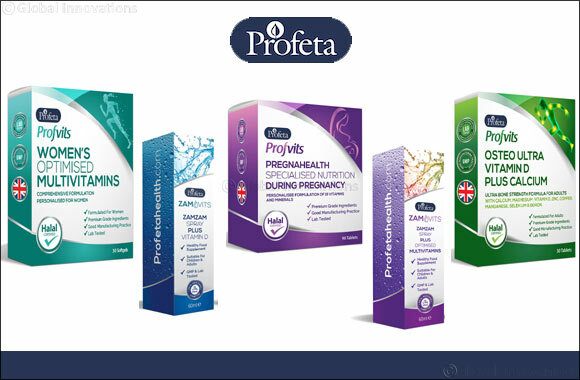 December 29, 2018: Profeta Health manufactures innovative products which bring together both medical science and traditional medicines based on the prophetic approach, such as innovative Halal Vitamin products in the ZamVits range, as well as being customer-focussed and formulating familiar essential supplements containing premium grade ingredients. Our pure, naturally sourced ingredients are free of contaminants and bonded to ensure maximum preservation of potency which is harnessed with modern lab quality methods. Profeta’s ZamVits Optimised Multivitamins ZamZam water Spray is HMC Certified Halal formulation. The formula for ZamVits ZamZam Multivitamins Spray is based on extensive international research and developed by experts for the specific nutritional intake and lifestyle needs of both adults and children from age two. We faithfully formulated our ZamVits products with Pure Zam Zam Water so you take blessed Zam Zam water together with your tailored dose of multivitamins daily. With concentrated spray formulation and enjoyable taste, you and your children will never forget to take your required optimum nutritional dose daily. One bottle of spray (60ml) provides over two months supply for an adult and more than a year for Children. Profeta’s ZamVits Vitamin D Plus ZamZam Spray is HMC Certified Halal formulation with the pure and optimum quantity of Vitamin D as a single product for you and your family. We faithfully formulated our ZamVits products with pure Zam Zam water so you take blessed Zam Zam water together with your tailored dose of Vitamin D daily. With concentrated spray formulation and enjoyable taste, you and your little ones will never forget to take your required Vitamin D dose daily. Profvits Super Strength Omega-3 soft gel capsules, designed to meet stringent high quality and purity standards, are formulated with high grade and high strength fish oil. The capsules provide a rich source of Omega-3 fatty acids DHA (Docosahexaenoic acid) and EPA (Eicosapentaenoic acid), as well as vitamin E to help maintain health and wellbeing. Designed for the demanding lifestyles of men, Profvits Men’s Optimised Multivitamins provide comprehensive and tailored premium grade vitamins and essential nutrients to support the healthy diet of men. Formulated to help men where they need it most; helping to reduce fatigue, boosting energy, supporting reproductive health and contributing to normal mental performance. Specially designed to give you targeted help where you need it, Profvits Super Strength Vitamin B Complex plus Vitamin C capsules are formulated with premium grade essential vitamins to help give you a strong immune system as well as healthy skin and nails. Designed to supplement Glucosamine and Chondroitin levels, which are essential for the creation of cartilage tissue, Profvits premium grade Glucosamine and Chondroitin tablets help to maintain optimum bone, joint and cartilage health. We understand that life is busy. Taking an all-in-one Profvits softgel capsule is a fast and easy way to ensure your body has the essential nutrients it needs. Specifically tailored for women, each Profvits multivitamin capsule provides: support for all-round female health; maintenance of healthy immune and nervous system; healthy skin, hair and nails and provides a normal energy release. Expertly designed to maintain healthy bones and teeth, Profvits Osteo Ultra supplements contain premium grade Vitamin D3, Calcium and other essential minerals to support optimal bone health throughout your lifetime. Each tablet provides your body with an excellent source of Calcium, vitamin D and Zinc. Profvits PregnaHealth provides essential nutritional support for both mums and babies. The advanced and carefully tailored formula of 19 premium grade vitamins and minerals, including folic Acid, vitamin D3 and iron. These ensure that you and your growing baby have a boost of everything you both need to maintain normal growth and optimum development. Profvits Children’s optimised multivitamin has been produced for the specific nutritional needs of children. A comprehensive formulation of nutrients based on extensive international research help maintains your child’s health supplement needs. Designed to maintain healthy bones, teeth, immune system and muscle function, Profvits Super Strength Vitamin D3 supplements contain premium grade Vitamin D3 to provide effective protection against Vitamin D deficiency. Profvits Super Strength Vitamin C tablets provide an effective sustained release to support your immune system. The combination of super strength Vitamin C, Rose Hip and Bioflavonoids work harmoniously to provide total support for your immunity, healthy blood and collagen formation. Specially formulated for children to help support strong, healthy bones and teeth. Profvits Children’s Osteo Ultra, with Vitamin D3, Calcium, Magnesium and Zinc is an easy way to ensure that your growing child has a complete supplement in a chewable tablet form. Taking an all-in-one Profvits gummy is a fast and easy way to ensure that your child has the essential nutrients they need. Specifically tailored for children, each Profvits Omega 3 gummy contributes to a child’s normal brain, visual and immune system development. The gummies provide the necessary requirements of Omega 3, including premium grade essential fatty acids EPA and DHA as well as vitamin E.
Taking a delicious blackcurrant flavour Profvits Children’s Vitamin C Soft Gummy is a fast and easy way to ensure that your child has 100% of their recommended daily allowance of Vitamin C along with other essential vitamins and minerals. Specifically tailored for children aged 4-12 years, each Profvits Children’s Vitamin C Soft Gummy contributes to keeping your child’s immune system strong. We know you’ll love our products as we do. However, if you have received your order in a damaged or faulty condition, you can return it to us within 30 days of the date you received the item, and we will issue a full refund. Please note: we can only accept the return of opened items if they are faulty. The amount that we will refund you will be the price that you paid for the product in question with the value at that time. We will also help you by refunding any delivery costs that you have paid however this depends on the circumstances of the order and the reason for cancellation. You can cancel a contract with us at any time but this is only if the products that have been sold are past their sell-by-date. If this is the case then you will be sent a refund for the price paid for the products. This will all be done in accordance with the refund policy that we have available. This does not affect your statutory rights. Under UK law, you have the right to withdraw from your purchase of an item within seven working days of the item’s delivery to you. However, we cannot accept cancellations of contracts for the purchase of products where the item has been unsealed. We offer a guarantee on all of our products. If you do want to cancel your order then you will need to let us know by contacting us online by visiting returns page in your dashboard. We give full assurances that any product that is purchased through our site is of a high standard and quality. We are also committed to our legal obligation to supply the products that are in conformity with the contract in place. Follow and visit their Social Media accounts @profetahealth on Facebook, Twitter, Instagram and YouTube.